Searching for that perfect high school graduation gift? 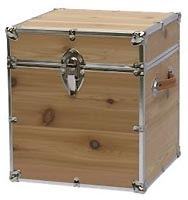 Continue the tradition of giving trunks with this classy cedar and stainless steel cube variety. This handsome locking trunk can withstand the weight of one quarterback or two cheerleaders. The future co-ed can lock and store expensive electronics and such, plus it can double as seating or a side table. This stylish cube will remain relevant for years and is a worthy investment for students of any age. Costs $115, plus $5 more for an engraved nameplate.